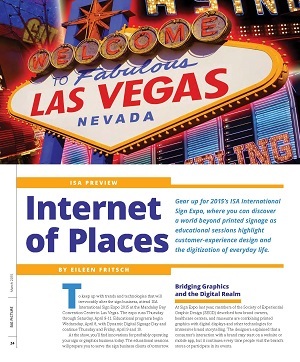 When Big Picture magazine asked me to write a preview of the upcoming ISA Sign Expo 2015 April 8-10 in Las Vegas, they wanted more than a simple recap of details that anyone could easily find online. They wanted insight into how Sign Expo differs from other big trade shows that feature a huge variety of wide-format printing and finishing equipment. In other words: Why should Big Picture readers attend Sign Expo this spring when they could see some of the same exhibitors at SGIA Expo or Graph Expo in the fall? Having served as a Big Picture editor, I know that Big Picture readers have never feared pushing the boundaries. Like true entrepreneurs, they understand that growth comes from helping customers solve problems and innovate. So, I recalled something that struck me at ISA Sign Expo in 2014. Attendees who didn’t make time to attend some of the educational sessions at Sign Expo missed an excellent chance to network with some important future customers and learn about the type of help they need from providers of architectural signage and large-format graphics. At the 2014 Sign Expo, the Society of Experiential Graphic Design (SEGD) coordinated an enlightening series of sessions about the types of technologically sophisticated projects architects and their clients want to create. As mobile technologies bridge the gap between the online world and physical spaces, experiential designers are hired to create branded, interactive “customer-experience” environments for corporate offices, museums, healthcare centers, universities, and public spaces. The relatively few people who attended the SEGD sessions at ISA Sign Expo 2014 learned that experiential designers are actively seeking companies that help them fabricate engaging customer experiences that blend printed graphics, digital signage, and one-of-a-kind models. The goal is to ensure that a consumer’s experience with a brand continues beyond the website and throughout the physical facilities. The SEGD presentations provided context about why the Sign Expo itself features such an eclectic mix of large-format graphics, digital signage, and equipment for making customized architectural signage. Experiential designers strategically blend digital communications with art, graphics signage, and other elements to help clients reinforce their brand mission, vision, and values, throughout the built environment. “Experiential design is what makes visiting a building memorable to the user, beyond bricks and mortar,” said Kelly Kolar. “A user’s experience with a brand is affected at multiple touchpoints, including architecture, interiors, the branded environment, promotional and educational materials, websites, and apps.” Experiential designers work hand-in-hand with architects, space planners, and interior designers to “and help craft what the ideal experience really is. Then, experiential designers work with other partners to bring all the elements of the story together. This year, SEGD members presented workshops at the Digital Signage Expo in March. But the educational sessions at this year’s Sign Expo will feature a full day of programming about digital signage, as well sessions on topics such as how to build a more design-centric company. When visiting the Sign Expo show floor this year, I will have a fresh understanding of the types of projects that creative designers are being asked to produce for retailers, healthcare organizations, museums, hotels, restaurants, and city planners. (It’s very exciting!) Attendees who fear “digital signage” will displace large-format graphics need to take a broader perspective. Big Picture readers helped grow the market for large-format graphics because they weren’t afraid to help creative professionals work through all of the technological challenges. I am already seeing evidence that a new generation of entrepreneurs is willing to participate in this next wave of innovation — reinventing the customer experience. Even though Sign Expo, Graph Expo, and SGIA Expo all feature many displays of digital printing and finishing equipment on the show floor, the educational programs at each show provide insights into the diverse ways the equipment can be used. For example, Sign Expo is more about outdoor advertising, architectural signage, and customized experiences within the built environment. Graph Expo is focused more on publishing, packaging, and integrated marketing communications. And SGIA Expo explores what’s possible with industrial printing, textile printing, garment decoration, dye sublimation, vehicle wraps, décor, and the emerging field of printed electronics. So if you want to explore the huge range of business opportunities made possible by all types of digital printing, I would encourage you to attend all three.